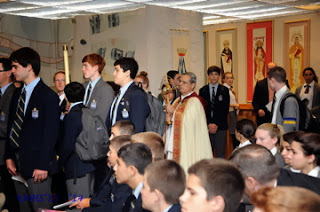 Eucharistic Adoration is celebrated every Monday after school in each of our Marianist high schools. 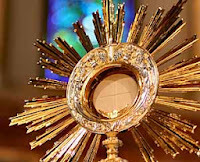 I truly look forward to Adoration; I realize I cannot do without it. This is my time to dedicate myself to personal prayer and reflection in the Presence of Jesus Christ silently, in prayer or through song. During Adoration, Jesus calls me to listen, he is inviting me to pray, and to listen is to pray. "Praying is listening" (Mark 4:1-20). In order to be aware of what the Lord is trying to convey to me, I must maintain an attitude of attentive receptivity. Listening does not merely mean using my sense of hearing; it involves being wholly attuned to the Lord. It means being available to God. During Adoration, Jesus is inviting me to listen carefully to what he is communicating. He wants me to listen not only with my ears, but to listen with my heart. As I listen to what Jesus is saying to me, I begin to experience a transformation-taking place within me. Prayer is my relationship to our loving Father. During Eucharistic Adoration, I reflect on God's creative, caring, forgiving, healing, and enduring love. As Jesus says, "when you look for me, you will find me." Many of us are searching for something to make us feel better; many are searching for a meaning in a world that is confused, chaotic, mixed up and sometimes hard to comprehend. When we are feeling disconsolate or discouraged, peace is a nebulous position, I recommend going to Adoration, if just for a short time. I am sure you will find that Adoration will be very inspirational and inspiring. Adoration is my time and it could be your time to develop a stronger relationship with our loving Father and put your trust in Him.